1) They’re flexible – in both senses of the word. It may seem like stating the obvious, but OLCD displays are lightweight, extremely thin and virtually unbreakable. This allows them to be wrapped around virtually any surface you encounter on a daily basis, with a bend radius down to just 10 mm. 2) They can be cut to almost any shape. Unlike glass, which is difficult to manufacture in anything but round or rectangular designs, OLCD displays can be quickly and easily cut to fit the shape of your product. You can even cut holes in the display without affecting performance, offering straightforward integration of anything from speakers and cameras to watch hands and toggle switches. 3) They have a low manufacturing temperature. The entire process takes place at below 100 °C, compared to 300-500 °C for silicon-based transistors. 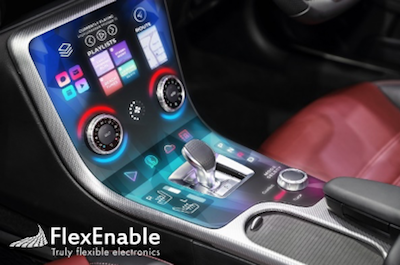 This dramatically reduces the cost of manufacturing flexible displays, by simplifying handling and allowing the use of lower cost plastics, as well as drastically lowering energy consumption during manufacturing. 4) They are scalable. The low cost and simple manufacturing process for OLCDs can be scaled to large sizes using standard equipment. This allows flexible plastic displays to be used for everything from smart watches and notebooks to ultra-thin, bezel-free monitors and TVs in the future. 5) They offer all the benefits of glass LCD displays. By sharing many of the components of traditional LCD displays (as well as the supply chain), OLCDs are a known quantity, with no trade-off in screen performance compared to their glass counterparts. They are robust enough to deal with vibrations and large temperature variations, and can be made bright enough for outdoor use without compromising lifespan, ideal for use in vehicles as well as consumer electronics. 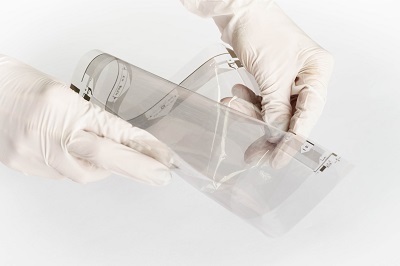 This flexible display technology, developed by our world-class team, is currently being brought to mass production with Truly Semiconductors in China. We can’t wait to see the innovative and unexpected uses OLCD displays are put to in the future. 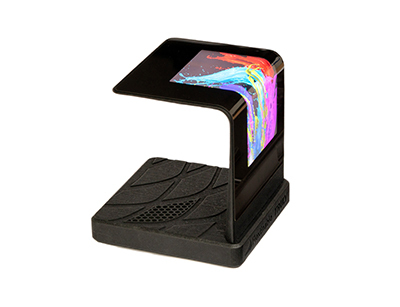 If you are looking for a flexible display solution, get in touch with us at info@flexenable.com.